Posted on Wed, Jan 11, 2012 : 7:57 a.m.
With the recent spate of sunny days, 2012 sure feels like it’s off to a great start. One look at the theater calendar for the month of January gives me the same warm fuzzies. Just two weekends in, and the listings are already chock full of lectures, special events and major productions. Numerous shows are opening this week, and several one-day events include lectures by theatrical greats David Henry Hwang and Robert Wilson, as well as local hero Ralph Williams. There’s even a new theater company making it’s way onto the scene—a hearty “Break a leg” to Threefold Productions on their inaugural show! With all this good stuff happening in area theaters you may find it hard to spend a night at home. But isn’t that why we live here, after all? Enjoying all the enriching experiences Washtenaw County has to offer is one of its denizens’ favorite pastimes. Show: Laughter on the Edge of the Abyss: Ralph Williams lecture on humor in Shakespeare’s Tragedies, one-time event, Jan. 12, 10 a.m. Description: Ralph Williams, professor emeritus of English language and literature at the University of Michigan, will delineate Shakespeare’s uses of humor within the direst tragedies. He is known for his courses on Shakespeare, the Bible in English, and Primo Levy, and has received numerous awards, including the first Lifetime Golden Apple Teaching Award. Fun fact: Professor Williams recently played a lead role in the movie “Answer This!” filmed in Ann Arbor. Show: David Henry Hwang lecture, one-time event, Jan. 13, 4 p.m. Description: The creator of the Tony Award-winning play "M. Butterfly," David Henry Hwang will discuss his new Broadway hit, "Chinglish." Fun fact: Hwang won the Tony in 1988. His current show is a comedy about a U.S. businessman trying to secure a lucrative deal in China. For tickets and information: 734-764-0446. The talk is free and open to the public, with a reception afterward. Show: "Bernhardt on Broadway," by Carol Dunitz, Jan. 14 at 2 p.m. and 7:30 p.m. Description: A one-woman musical about Sarah Bernhardt, often referred to as the most famous actress who ever lived. Set in the 1890s when the Divine Sarah was at the height of her career, the show is reminiscent of the Golden Age of Musicals. This "no holds barred" exposÃ© profiles the world's first superstar, the daughter of a Jewish courtesan who overcame countless obstacles, formed her own theatre company, and traveled the globe performing to sold out crowds from Russia to Brazil. Fun fact: Bernhardt initiated celebrity product endorsements and hobnobbed with royalty on a regular basis. She starred in Queen Elizabeth, the first full-length silent film. Film distribution receipts in the United States enabled Adolph Zukor to co-found what is today known as Paramount Pictures. Show: Philip Glass & Robert Wilson lecture, one-time event, Jan. 15, 4 p.m. Description: Philip Glass is a New York-based composer of avant-garde music, known for an elaborately structured and repetitive style that has been ironically dubbed as "minimalist." Robert Wilson is an American avant-garde stage director and playwright who is considered one of the world’s foremost vanguard theater artists. Together the two are best known for their collaboration on the four-act opera “Einstein on the Beach”. Fun Fact: Established with the generous support of alumna Penny W. Stamps, the Speaker Series brings respected emerging and established artists/designers from a broad spectrum of media to conduct public lectures and engage with students, faculty, and the larger U of M and Ann Arbor communities. Show: The “It Gets Better” Project Cabaret, one-time event, Jan. 16, 8 p.m. Description: Growing up isn't easy. Many young people face daily tormenting and bullying, leading them to feel like they have nowhere to turn. This is especially true for LGBT kids and teens, who often hide their sexuality for fear of bullying. The “It Gets Better Project” was created to show young LGBT people the levels of happiness, potential, and positivity their lives will reach—if they can just get through their teen years. Visit itgetsbetter.org for more information. Description: Boys will be boys, but adults will be worse! In this 2009 Tony-winner for Best Play, two couples meet at one of their homes to discuss a playground altercation between their young children. Hostility rumbles just under the surface, as their civilized battle of wits and words devolves into a hilariously chaotic evening, where nothing is safe, not even the furniture. This comedy of (bad) manners will change the way you look at polite conversation. Contains adult themes. Fun fact: In the “it’s a small world after all” category: Phil Powers—Chelsea native, PNT associate artist, and former resident artist at the Purple Rose plays “Alan”—the role Jeff Daniels, Chelsea native and executive director of the Purple Rose, originated on Broadway. • Creating theater that provokes genuine emotion within its audience. • Contributing to the thriving artistic community of the Metro-Detroit area. • Testing the boundaries of the traditional theatrical experience through bold, individual choices in scripts, design elements and performance. • Providing a platform where both professional artists and emerging talents are able to express and develop a distinct viewpoint. • The idea that theater is a mercurial art form that continues to evolve long after show has opened. Thu, Jan 12, 2012 : 11:23 a.m. 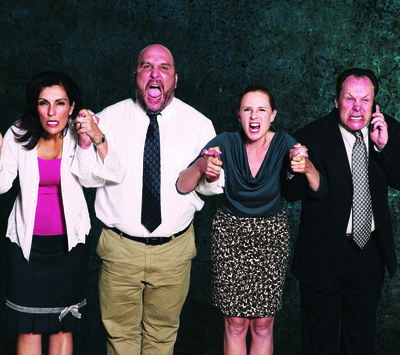 The photo for Performance Network's GOD OF CARNAGE must be one of the worst publicity photos ever. Who's idea was that! And again, self promotion runs rife, the only photo used in the article is of a production at Ms. Milarch's, Performance Network. mmmmm! Wed, Jan 18, 2012 : 2:12 p.m. I wasn't responding to the photo being in A2 News, merely that it was a bad idea for a publicity photo in the first place. Thu, Jan 12, 2012 : 2:45 p.m.
Just FYI, I'm the one who inserts the photos in this column, not Carla.